Classy Gear - Gear We Like :: January 2011 | It's not your tech, it's how you use it. If you didn’t get what you wanted for the holidays and you’re still sitting on a pile of gift cards that people gave you – mostly because they couldn’t tell what you really wanted either – I’m here to help. This month’s Classy Gear column is dedicated to those folks who may not have a ton of cash to spend but still want some stylish and interesting tidbits that are easily available for reasonable prices. You know, things that won’t break your bank but can still help you work better or play smarter. So I won’t make your wallet whimper this month with shiny HDTVs to watch the Super Bowl on (lots of sites are doing that roundup about now, I don’t need to repeat it for you) or whether or not this month is a great time to buy a car, but what I will do is help you out with a few things that will make the year a little smoother….or at least more interesting. You made a New Year’s resolution to get to the gym more often, right? Or maybe you made a smarter New Year’s resolution and decided to try and live a little healthier, right? Good. In that case, you’ll need to stay hydrated – most of us are perpetually dehydrated and don’t nearly get enough water during the day to stay healthy and keep our bodies working smoothly. We wind up with mystery headaches, aches and pains, and wind up snacking when our bodies are trying to tell us that it’s thirsty. I had a dietitian tell me once that you should drink half your body weight in ounces of water per day. That means that if you’re 200 lbs, you should be drinking 100 ounces of water daily. I know it sounds like a lot, but it’s something to work up to, and you’ll be healthier overall for it. The best way to do it is to pick up a nice shiny water bottle, like the KOR One Hydration Vessel , which not only looks sharp but holds a ton of water (750ml, approx 25 ounces,) and figure out how many of the bottle you should drink per day. If you’re 200 lbs, you probably want to drink four of those bottles each day – not at once, just over the course of the day. See? That’s not so bad. The beauty of the KOR One is that it’s attractive, it’s BPA-free so you can get around that whole controversy without having to think about it, has a tapered shape so it can fit in most bags and backpacks, has a wide mouth so you’re not sucking on a sport top for ages trying to get water out, and it’s dishwasher-safe. 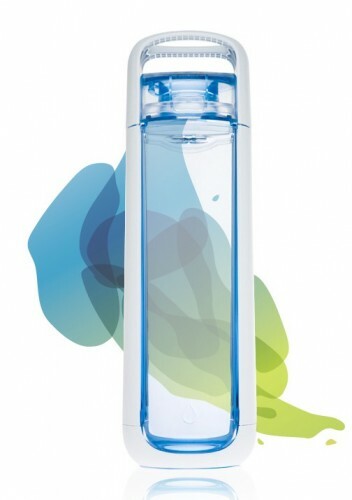 The handle makes for easy cleaning, and – before I forget – the water bottle was seen in Iron Man 2. Take that however you choose. Sadly the Joystick-IT controller for iPad isn’t available just yet, but it will be soon. The sheer awesomeness of the device though comes through in the YouTube video above – and if you have an iPad you’ll want to spend the $24.99 on one when they’re available to order later this month. Tons of games use virtual joysticks to control your character movement, the direction you’re facing, or both, and one of the most common complaints about iPad games that use virtual keyboards is how difficult it can be to control while you’re holding your iPad. That’s what the Joystick-IT was designed for: to give you a way to use the virtual joystick on-screen more like an actual joystick. The conductive suction cup on the bottom of the Joystick-IT is designed to keep your iPad’s screen safe from smears and scratches, and can be repositioned anywhere on the display that the control joystick is located. So the next time you fire up Street Fighter IV for the iPad, you can actually execute all of those special moves as though you were standing in an arcade. 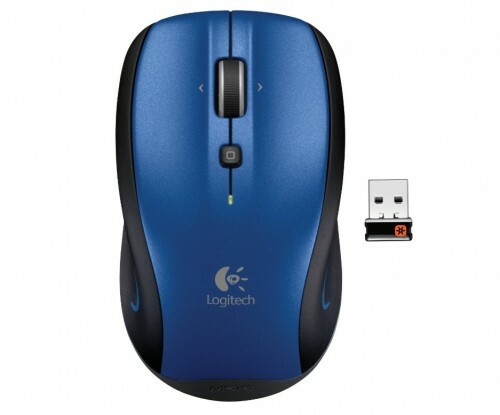 Logitech took the wraps off of the Logitech Couch Mouse M515 just last week. It’s $49.99 list price, and features a simple, ergonomic design with a fully-enclosed bottom that also encapsulates the optical sensor on the underside. The M515 also has a hand-activated sensor on the top so the mouse only turns on when there’s a hand on top of it. This way, Logitech promises you can get up to 2 years of battery life out of the little thing. If you’re wondering why it’s called the “Couch Mouse,” and why there’s so much emphasis on keeping it all enclosed and the battery life good and long, it’s because the M515 is designed mostly for people who need a mouse to use with their home theater PCs: a mouse that’ll work just as well on the couch as it would on a flat surface like a desk. The enclosed body design is so you don’t get lint and other debris in the seams between the top and the bottom, or lodged into the space where the sensor lives. It also makes for an smooth glide across any type of textured surface, like a blanket, pillow, or just the fabric surface of your couch. The Click n Cook actually started out as a project over at Quirky, where the community wanted a way to quickly move between kitchen implements with the same handle design without filling a cabinet full of various – and often expensive – tools that each only do one thing. 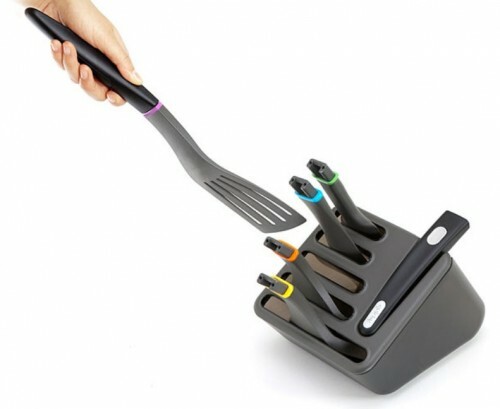 The Click n Cook gets around this problem by giving you a single, ergonomic, and attractive handle that attaches to and detaches from different cooking ends easily when you need them. When you don’t need them, they live inside of a knife block-style holster that lives on your countertop, ready for use. Need a spatula? Just click the bottom into the spatula attachment and go to work. When you’re finished, you can detach the spatula end, drop it in the sink, and attach a different end if you need it, like the slotted spoon attachment for stirring pasta, or the mixer attachment for stirring batter. You even get two handles, and the whole kitchen system will only set you back $34.99. The Gear4 Unity Universal Remote turns your iPhone into something we all need in your home theaters and entertainment centers but don’t want to spend any additional dough on: a universal remote. After all, you have your smartphone with you at all times anyway, right? Why not put it to good use while it’s sitting on the coffee table and you’re watching television? The puck – which in reality is the only part of the Gear4 Unity Universal Remote that you actually wind up purchasing, is actually an IR base station that can be programmed to control virtually every device in your home entertainment system that accepts controls via IR signal – you know, like a normal remote control sends? Here’s how it works: you program your phone to connect with the puck over Bluetooth, and your phone tells the puck what devices are in your home entertainment setup and what their model numbers are. You use your iOS device to send commands to the puck, like “volume up” and “channel up,” or “switch to DVD player,” and the puck then interprets those commands, translates them into IR signals that your home entertainment gear can understand, and then sends them out on your behalf. The beauty is that your phone uses Bluetooth to talk to the Unity, and the Unity uses IR to talk to your gear – no conflicts, and the gadget can be regularly upgraded to learn new devices, as can the app on your iPhone, iPod Touch, or iPad. 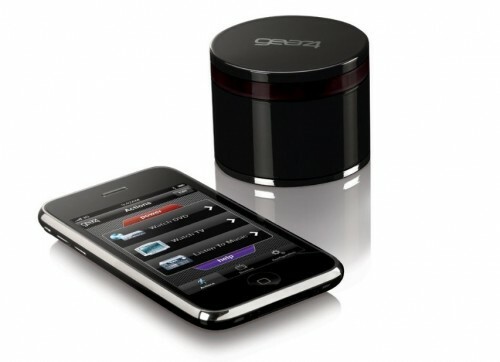 It’s a perfect universal remote system, and it makes use of a phone you already have in your pocket. That’s all for this month’s Classy Gear segment! Most of the items in the list are useful, affordable, and won’t kill your wallet or your budget. As usual, leave a comment if you’ve seen a useful gadget you’d like to see included in a Classy Gear roundup, or have some experience with one of the items in this week’s roundup.